There is hardly a bigger Good Food movement success story than that of Whole Foods Market. From a single store in Austin, Texas, that opened in 1980, Whole Foods blossomed not only into the nation’s biggest natural products supermarket chain, but a major force in the grocery industry, and is now its most valuable chain. Along the way, Whole Foods has helped introduce millions of Americans to concepts such as organic, non-GMO, sustainable seafood, and grass-fed beef and dairy products, boosting the expansion of the movement itself. 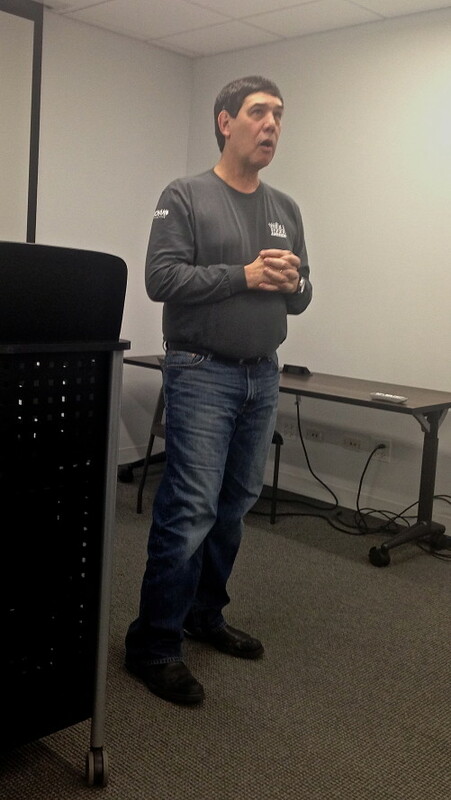 So Michael Bashaw — president of Whole Foods Market’s 48-store-and-growing Midwest region — had a very attentive audience when he spoke on Feb. 2 to entrepreneurs, financiers, and others associated with FamilyFarmed‘s Good Food Business Accelerator program at 1871, Chicago’s center for entrepreneurship and innovation. Whole Foods is a key partner in FamilyFarmed’s Accelerator program, which provides mentorship, technical assistance, and networking opportunities to a selected group of nine Fellows, each of whom run food or farm businesses in the Good Food sector. 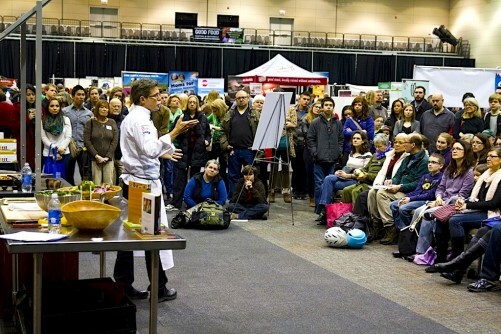 The grocery chain, a longtime supporter of FamilyFarmed’s efforts to expand the market for Good Food, will again be a sponsor of the organization’s annual Good Food Festival & Conference, scheduled for March 19-21 at Chicago’s UIC Forum. Bashaw was talking to budding Good Food entrepreneurs who are hungry for financial success, and implored them to focus on building business skills. 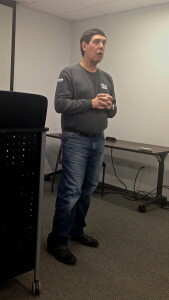 “We’re a feel-good business, but we think of ourselves as a very good business. Good, smart business people, analytical business people,” Bashaw said. But the theme of his talk and q-and-a session was not about the nuts and bolts of business planning, but rather about the employer-employee relationships that he portrayed as the secret to Whole Foods’ success: a corporate culture that both encourages and requires responsibility among senior leadership, store managers, and team members; a relatively non-hierarchical approach to leadership and management; and an openness to new ideas bubbling up from within the ranks. Despite its enormous popularity and its role in promoting a healthier and more sustainable food system, Whole Foods Market has hardly been immune to criticisms, some of them barbed, about matters such as its upscale image and aversion to union organizing. It is also facing mounting competition from mainstream retailers targeting the lucrative natural and organic products sector that Whole Foods has elevated to mainstream status. Whole Foods’ stock price dropped precipitously last year when Wall Street realized the challenge that this mainstream competition presented to the chain. Whole Foods responded with a $20 million advertising campaign that emphasized the chain’s core values. On a macro level, the campaign succeeded in propping up Whole Foods’ stock price. In addition, Bashaw asserted that the campaign affirmed the companies’ leadership in bringing authentic products to people and families. “Part of the campaign came from a feeling that we knew who we are, and the media didn’t always portray us the way we thought we were,” Bashaw told the Accelerator program gathering. He also discussed Whole Foods’ recent and ongoing efforts to move out of its comfort zone in affluent neighborhoods and open stores in more economically disadvantaged locations, such as downtown Detroit and the Englewood community on Chicago’s South Side. Bashaw worked directly with Whole Foods co-CEO Walter Robb to develop both these stores. The Englewood location is on track to open in 2016. Whole Foods’ regional leadership is working actively with FamilyFarmed through its Accelerator, as well as with other local leaders, to vastly increase the number of Chicago-made products that will be sold at the store and throughout the region, helping to build the type of local food cluster vital to the continued growth of the Good Food movement. Bashaw is a co-chairman of FamilyFarmed’s Good Food Financing & Innovation Conference on March 19 — the kickoff for the three-day Good Food Festival & Conference — along with Marc Schulman, president of Chicago-based Eli’s Cheesecake, and Jennifer Worstell, a member of the FamilyFarmed Board of Directors. Food and farm businesses that have participated in the conference during the past three years now have raised more than $10.5 million from debt and equity investors. This year’s event includes more than 20 food and farm businesses that will be seeking capital. It also includes speakers such as chef Rick Bayless of the Frontera Mexican food empire; Cook County (Chicago) Board President Toni Preckwinkle; CEOs from Lifeway Kefir, Argo Tea, and Koval Distillery; plus leaders from the U.S. Department of Agriculture, 1871, the U.S. Small Business Administration; and more. Michael Bashaw visited on Feb. 2 with associates of FamilyFarmed’s Good Food Business Accelerator program. 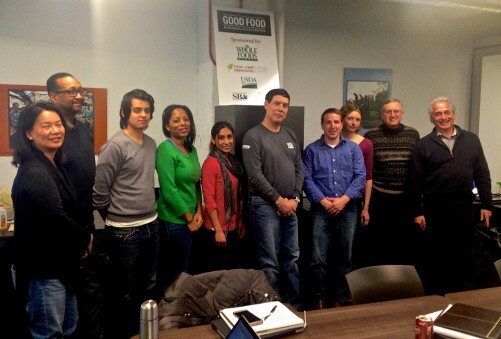 From left, Jenny Yang of Phoenix Soy; Thomas Frierson of Spark of the Heart; Alberto Rincon of Urban Canopy; Riana Lynn of Food Trace; Rowida Assalimy of Ro’s Beverages; Bashaw; Mark Schneider of Living Water Farms; Raya Carr of Mint Creek Farm; Joel Blechman, director of the Good Food Business Accelerator; and Jim Slama, president of FamilyFarmed. This entry was posted in Farm businesses, Food Artisans, Food Entrepreneurs, Good Food Business Accelerator, Good Food business development, Good Food Festivals, Good Food Financing Fair, Good Food marketing, Good Food Success Stories, Natural food and products industry, Sustainable food retailing, Whole Foods Market and tagged 1871, FamilyFarmed, food artisans, Food Entrepreneurs, Food entrepreneurship, Good Food Business Accelerator, Good Food Festival & Conference, Good Food movement, Good Food supply chain, local food, sustainable food, sustainable food retailing, Whole Foods Market. Bookmark the permalink. What wasn’t reported here was that Whole Foods only opened the stores in Detroit and Englewood following government handouts. Specifically, Detroit and the State of Michigan gave $5.8 million to Whole Foods. Chicago gave $10.7 million. The talk failed to explain why Whole Foods would not open the stores on its own and demanded government to hand over millions of dollars for the privilege. It is not a big risk to enter economically struggling communities when government is paying the tab. Each store is about 22,000 square feet, which is at least half of the size of a typical Whole Foods store. when it is mentioned that the Detroit store has outgrown its space, the small store size should be taken into consideration. If you’re seeking nutrient dense food, Whole Foods may be a better option than one of the few other options we have, i.e. 3 companies sell well more than 50%+ of the nations groceries. But that doesn’t mean it’s perfect, i.e. it’s sheer size means it’s not ‘economical’ for them to buy from the best designed farms, and it’s a multibillion dollar corporate entity so it’s profits flow away from the community and to the top. A better model is Food Cooperatives. The Dill Pickle in Logan Square is thriving and there are six more in the works, e.g. The Sugar Beet in Oak Park opens this spring. And that’s on the way towards worker-owned food cooperatives. If you’re interested in a sustainable model, check out Rainbow Grocery in San Francisco. Hello, Would like to do a food accelerator project here in Ontario Canada. 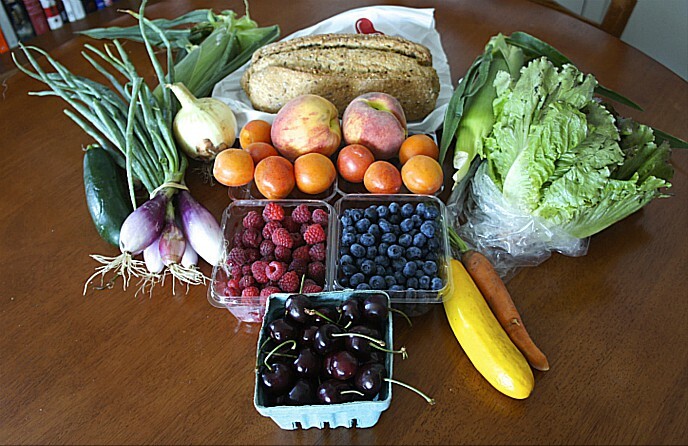 South Western Ontario and local counties produce an abundance of fresh produce. I am coordinating the AG-Ambitions Program and looking to change up the program for fall-winter 2015/2016. Who would be a good contact with Whole Foods in Ontario Canada for that conversation?